Wet weather at the end of the last ice age appears to have helped drive the ecosystems of large grazing animals, such as mammoths and giant sloths, extinct across vast swathes of Eurasia and the Americas, according to our new research. The study, published in Nature Ecology and Evolution today, shows that landscapes in many regions became suddenly wetter between 11,000 and 15,000 years ago, turning grasslands into peat bogs and forest, and ushering in the demise of many megafaunal species. By examining the bone chemistry of megafauna fossils from Eurasia, North America and South America over the time leading up to the extinction, we found that all three continents experienced the same dramatic increase in moisture. This would have rapidly altered the grassland ecosystems that once covered a third of the globe. The period after the world thawed from the most recent ice age is already very well studied, thanks largely to the tonnes of animal bones preserved in permafrost. The period is a goldmine for researchers – literally, given that many fossils were first found during gold prospecting operations. Our work at the Australian Centre for Ancient DNA usually concerns genetic material from long-dead organisms. As a result, we have accrued a vast collection of bones from around the world during this period. But we made our latest discovery by shifting our attention away from DNA and towards the nitrogen atoms preserved the fossils’ bone collagen. 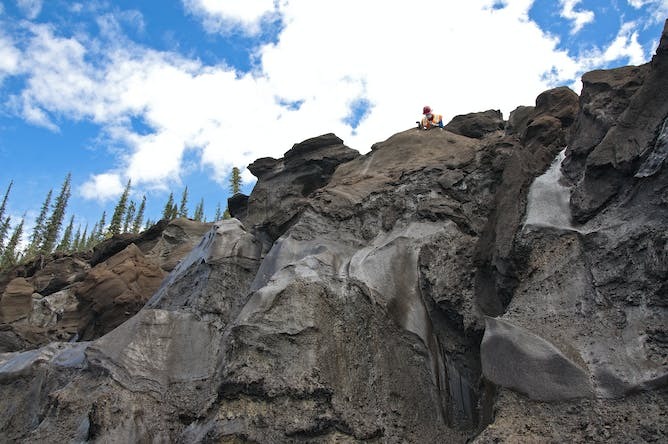 Lead Author Tim Rabanus-Wallace hunts for megafaunal fossils in the Canadian permafrost in 2015. Nitrogen has two stable isotopes (atoms with the same number of protons but differing number of neutrons), called nitrogen-14 and nitrogen-15. Changes in environmental conditions can alter the ratio of these two isotopes in the soil. That, in turn, is reflected in the tissues of growing plants, and ultimately in the bones of the animals that eat those plants. In arid conditions, processes like evaporation preferentially remove the lighter nitrogen-14 from the soil. This contributes to a useful correlation seen in many grassland mammals: less nitrogen-14 in the bones means more moisture in the environment. We studied 511 accurately dated bones, from species including bison, horses and llamas, and found that a pronounced spike in moisture occurred between 11,000 and 15,000 years ago, affecting grasslands in Europe, Siberia, North America, and South America. 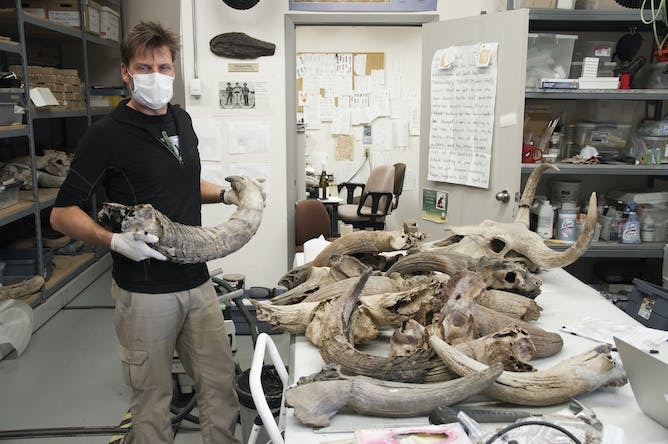 Alan Cooper inspects ice age bones from the Yukon Palaeontology Program’s collection, Canada, 2015. At the time of this moisture spike, dramatic changes were occurring on the landscapes. Giant, continent-sized ice sheets were collapsing and retreating, leaving lakes and rivers in their wake. Sea levels were rising, and altered wind and water currents were bringing rains to once-dry continental interiors. 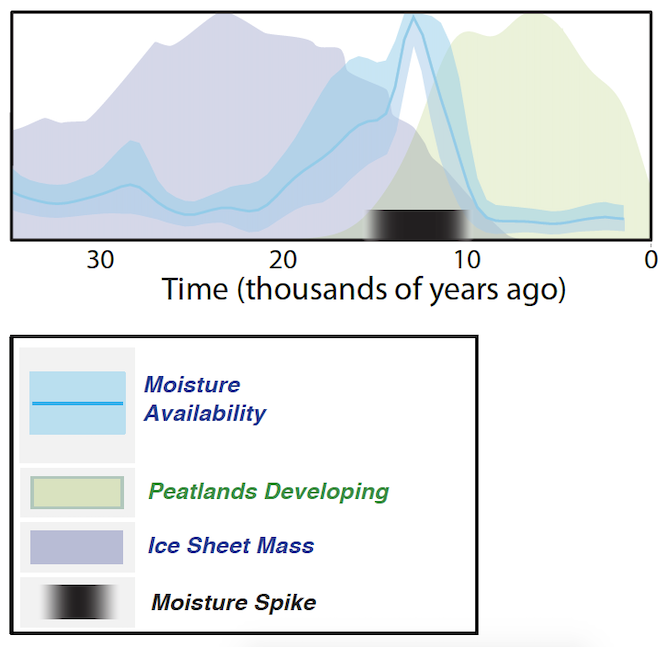 The study shows that a peak in moisture occurred between the time of the ice sheets melting, and the invasion of new vegetation types such as peatlands (data shown from Canada and northern United States). As a result, forests and peatlands were forming where grass, which specialises in dry environments, once dominated. Grasses are also specially adapted to tolerate grazing – in fact, they depend upon grazers to distribute nutrients and clear dead litter from the ground each season. Forest plants, on the other hand, produce toxic compounds specifically to deter herbivores. For decades, researchers have discussed the idea that the invading forests drove the grassland communities into collapse. Our new study provides the crime scene’s smoking gun. Not only was moisture affecting the grassland mammals during the forest invasion and the subsequent extinctions, but this was happening right around the globe. This discovery prompts a rethink on some of the key mysteries in the extinction event, such as the curious case of Africa. Many of Africa’s megafauna — elephants, wildebeest, hippopotamus, and so on — escaped the extinction events, and unlike their counterparts on other continents have survived to this day. 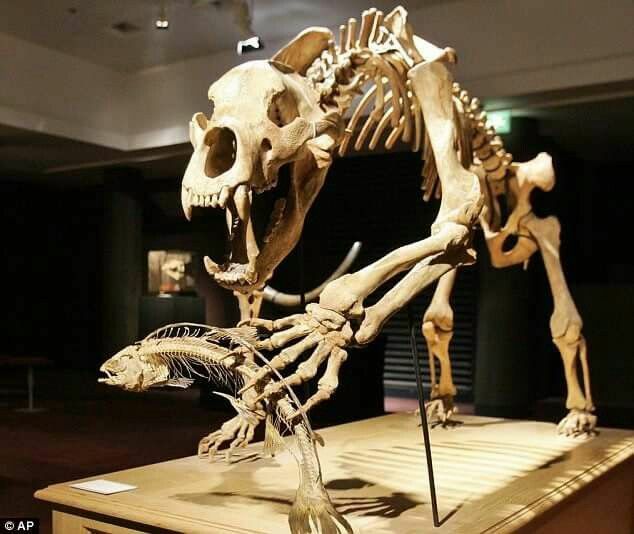 It has been argued that this is because African megafauna evolved alongside humans, and were naturally wary of human hunters. However, this argument cannot explain the pronounced phase of extinctions in Europe. Neanderthals have existed there for at least 200,000 years, while anatomically modern humans arrive around 43,000 years ago. 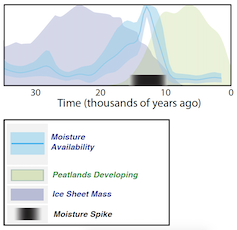 We suggest instead that the moisture-driven extinction hypothesis provides a much better explanation. Africa’s position astride the Equator means that its central forested monsoon belt has always been surrounded by continuous stretches of grassland, which graded into the deserts of the north and south. It was the persistence of these grasslands that allowed the local megafauna to survive relatively intact. Our study may also offers insights into the question of how the current climate change might affect today’s ecosystems. Understanding how climate changes affected ecosystems in the past is imperative to making informed predictions about how climate changes may influence ecosystems in the future. The consequences of human-induced global warming are often depicted using images of droughts and famines. But our discovery is a reminder that all rapid environmental changes — wet as well as dry — can cause dramatic changes in biological communities and ecosystems. In this case, warming expressed itself not through parched drought but through centuries of persistent English drizzle, with rain, slush and grey skies. It seems like a rather unpleasant way to go.